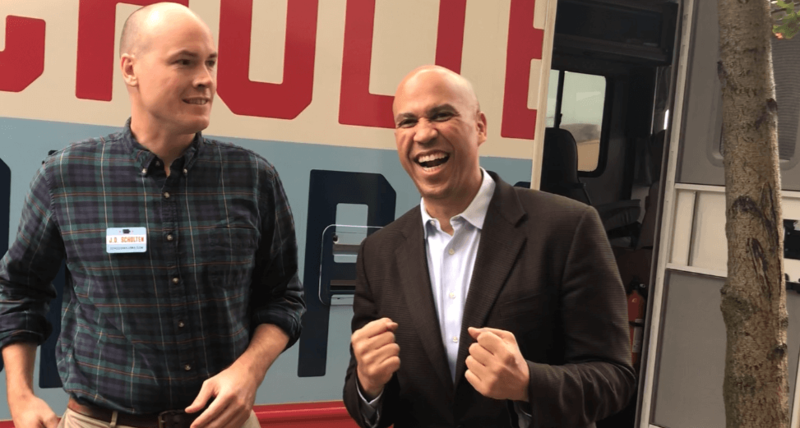 Guest piece from New Jersey Senator Cory Booker on his recent trip to Iowa. It was an honor to be in Iowa last Saturday until Tuesday of this week, traveling across the state in support of your incredible ticket of Democratic candidates. What I witnessed lifted, encouraged, and inspired me: 1,200 Iowa Democrats filling a convention hall to support candidates up and down the ballot. Dozens rallying in the rain on a front porch in Adel before voting early at the county courthouse. Many more packing shoulder-to-shoulder into a storefront campaign office over the lunch hour in Boone. Filling a community center basement — and then some — in North Liberty. Everywhere I went, volunteers of all ages were committing to knock doors, make phone calls, and give just a little bit more. Iowa is standing up to President Trump and his Republican allies’ relentless attack on our most fundamental values not by giving in or giving up, but by resolving to never let despair have the last word. You are energized. You are organized. And you aren’t letting your outrage win — you are using it as your own fuel to get out working. We’re down to the home stretch before Election Day. We must fight on these last few weeks, and redouble our efforts. Because when we do, something special is going to happen in Iowa — and it will lead the way for the rest of the country. We will flip the state house and state senate. We’ll have a governor in Fred Hubbell and a lieutenant governor in Rita Hart who will put people first and get Iowa growing again. We’ll have champions in Rob Sand as Iowa’s next State Auditor, who will turn out the lights on waste and fraud in state government, in Tim Gannon as the next Secretary of Agriculture, who will never stop fighting for rural Iowa, and in Deidre DeJear, who will work to make voting easier and more accessible than ever before. We’ll send Dave Loebsack back to Congress, and elect Abby Finkenauer, Cindy Axne, and J.D. Scholten to check President Trump’s non-stop attacks on American values. And Iowa is poised to send another message on November 6th: this is a state that not only believes women, but elects women. There are more Democratic women running for office in Iowa than ever before, and for the first time, Iowa could have gender parity in its Congressional delegation. This is a critical time in our history. There are people right now who want to divide us, but if there’s one thing I know for sure, it’s that the forces that seek to divide us are nowhere near as strong as the ties that bind us. Every generation of Americans has worked to fulfill the destiny set out by our Founders: to create a more perfect union. Whether it was abolitionists fighting against slavery, suffragettes demanding their right to vote, or civil rights activists marching in Selma — our shared history is one of fighting for the soul of our democracy. Let’s do our part over the next 25 days — and when we do, I know that when we wake up on November 7th, arising out of the darkness will be a new day of light, hope, and progress.